Mark had to work today, so I took the car and ran errands all over the island. First stop was Blaisdell Center where I thought I'd buy concert tickets to Earth, Wind and Fire. Turns out the concert is already almost sold out; only a few tickets left and in not so good seats. We decided to put the money into an island hopping trip. On my way back to the parking lot, I spotted Elvis. 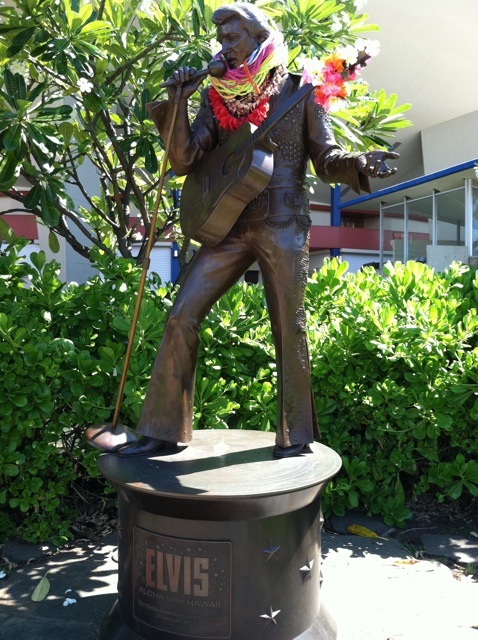 Yes, Elvis lives on the Blaisdell Center grounds. I stood in front of his flower-bedecked statue and remembered watching Elvis' Hawaii concert on TV when I was a kid. I was sitting on the floor of our family room in the Bay Area, with the boxy Zenith TV set upon the carpet. Elvis was sparkly and sweaty. I remember my father yelling to my mom who was washing dishes in the kitchen, "Come look how fat Elvis is." With dishtowel in hand, Mom entered the family room. "Must be drugs," was her answer. She shook her head and went back to the dishes. Later that afternoon, while sitting in the car, I listened to KKOL 107.9, which plays mostly rock hits from the 60's,70's and 80's. I was on a two lane road, during a bright gorgeous Hawaii afternoon, the kind where the sky is really blue, the green trees and plants and hills are almost emerald in color and the flowers that grow on the tips of trees pop with orange, yellow and red. The DJ announced he was playing a set of songs from the only musical family to have a grandfather, son and grandson as superstars. Surprisingly, the next minute I was singing out loud to Hank Williams Jr.'s, "Family Tradition." Country music guided me all through high school and college, especially Hank Williams Jr. I could feel better instantly singing one of his songs while driving to the then unspoiled ranch lands in Orange County. There was also a night in college spent at my sorority sister's cattle ranch, listening and dancing to country music under the oak trees and stars. Although it seemed weird to drive through a tropical landscape and hear a song from days I spent in California grasslands with farms and ranches nearby, I felt happy belting out the lyrics today. Thanks KKOL.